This Friday (April 22, 2011) is Earth Day so I would be remiss if I didn't mention the synergy of Lean and Green efforts and techniques to mutually eliminate waste. This combination of thinking can help you make everyday Earth day in your organization. Here is a portion of a popular article I wrote about a year ago. Many manufacturers know the benefits of Lean manufacturing: higher productivity, better quality, reduced cycle time, plus enhanced employee engagement. Lean is excellent at marshalling different groups and individuals into a high performing team focused on rooting out waste. That relentless focus on eradicating waste makes Lean a necessary partner for Green. 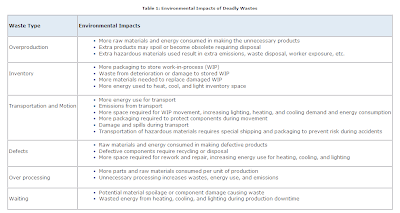 Lean efforts can lead to significant environmental gains since environmental wastes are related to Ohno’s 7 deadly wastes. 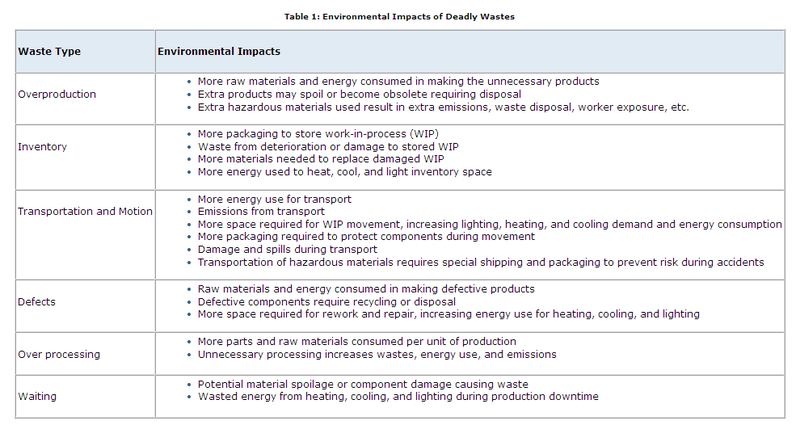 The table below from EPA's Lean and the Environment Toolkit lists the environmental impact of these wastes.